So, At the end of week two I have not a whole lot of activity to report on the Monarch front. But http://www.wunderground.com/maps/ shows a cold front over the great lakes region, and word is- MONARCHS will be arriving! Possibly as soon as the weekend. But for this week the monarch census was slow, with a humble 5.88 Danaus plexippus per hour. I've created an bar graph using Excel to track the weekly changes. 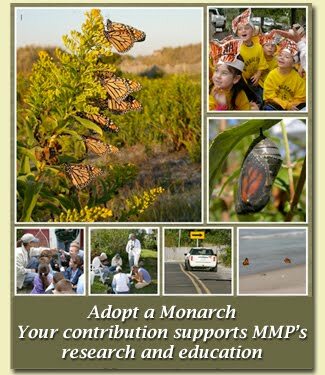 Monarch Censuses are a 5 mile route conducted 3 times per day, 7 days per week. Along with observed monarchs, we record the time, air temperature, sun visibility, wind speed, wind direction, and total number of minutes that the census takes. I'm using weather.com or wunderground.com at Cape May Point, NJ for all of my weather data. Don't forget to wave "hi" to Jewel when you see her! See you around the butterfly bush!